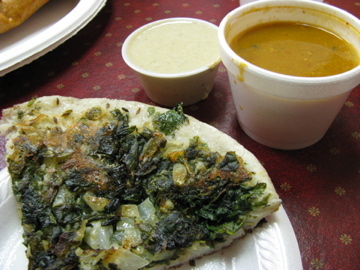 Today was my first trip to Dosa Corner, a South Indian Vegetarian restaurant at Kenny and Old Henderson. I have been meaning to go there for ages and took advantage of the Veterans’ Day holiday and having a willing accomplice to treat myself to a longer than average lunch break. My previous experience of South Indian food in Columbus was at the Udipi Cafe which I am a big fan of, but it is quite a bit further away and 20 minutes seemed too far to drive for a weekday lunch (although I am tempted to try their lunch buffet sometime). 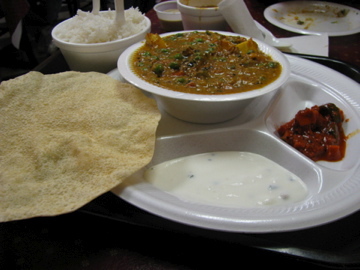 Dosa Corner is a no frills sort of place which seems to focus on take-out and seemed to be doing a reasonable trade. I don’t know as much about Southern Indian cuisine as I would like as my own experience in India was in the North and it is different to the anglicized versions of Indian food that I am most familiar with. We tried a few things at Dosa Corner and everything was very good. My only complaint was that because they are largely a take-out establishment they use paper, polystyrene and plastic plates, cups and cutlery, which seems wasteful and I much prefer eating off something more substantial and reusable. It is quite refreshing (excuse the pun) to have a jug of tap water without ice though. The speciality of the house is of course the Dosa and there are many different variations. 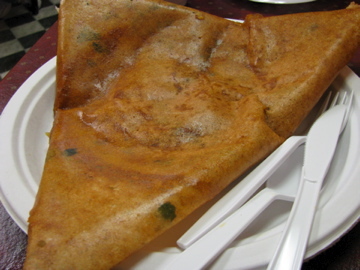 A dosa is a thin crispy crepe made from rice and lentil flour that usually comes wrapped around some sort of filling, although you can get them plain. We had the channa masala dosa with curried chickpeas, potatoes and lots of fresh cilantro, which was really delicious although a little greasy. Another hit was the spicy spinach Uthappam. Both come with sauces to dip them in. An uthappam or uttapam is a pancake where the other ingredients are cooked into the batter, so it looks a little more like a pizza. It is thicker, more spongey and less crispy. We also shared some mutter panneer made with homemade cheese and one of the lentil donuts, out of pure curiosity (and greed). Washed down with some indian chai, it was a filling and warming meal for a wintry day and very reasonable for the amount of food we ordered (more than we could eat). I will definitely go back as I want to try the Mysore dosa. Dosa Corner’s got amazing food. I wish I could get past the 72 pieces of disposaware to get through a meal. It’s not just wasteful, the zillion containers detracts from the meal.